Instead of getting takeout, try making these Chinese-style potstickers at home. 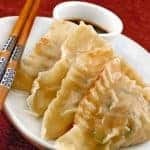 The store-bought wonton wrappers are rather delicate and when combined with the flavorful shrimp and pork filling they yield a tender, moist dumpling that is much lighter than the average takeout restaurant version. 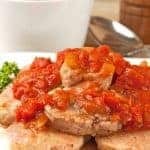 They take a little time to prepare, but this recipe makes about 4 dozen, leaving plenty for you to freeze to enjoy another day. 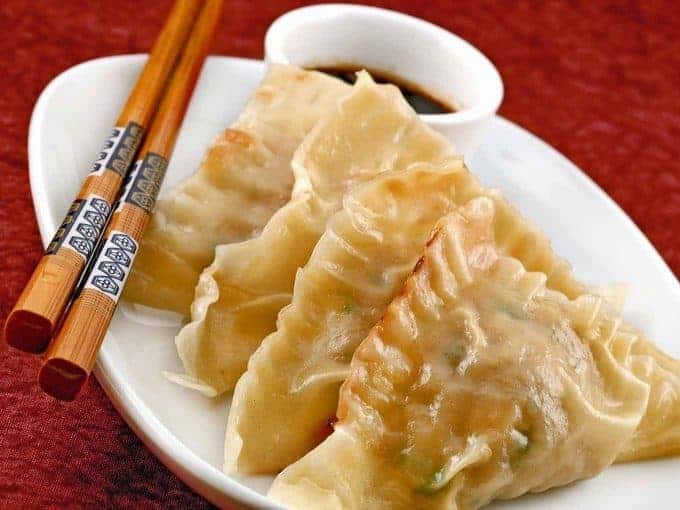 Store-bought wonton wrappers and a tasty filling made from shrimp, pork, cabbage, garlic and soy sauce make a lighter, tender version of this Chinese takeout favorite. 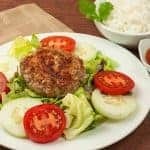 Combine the cabbage, green onions and garlic in the work bowl of a food processor and pulse until very finely chopped. 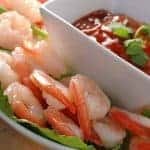 Add the raw shrimp, ground pork, soy sauce, fish sauce, sherry, sugar, cornstarch and black pepper and pulse until thoroughly mixed. Cover a flat work surface with wax paper and place a small bowl of water within easy reach. Working with one wonton wrapper at a time, mound about 2 teaspoons of the filling in the center. Wet your index finger and moisten the entire outer edge of the wrapper around the filling and fold in half. Press the sides together and gently crimp with a fork. Combine all of the sauce ingredients in a measuring cup, transfer to individual serving dishes and set aside. To pan fry, heat 1-1/2 tablespoons of vegetable oil in a large pan over medium-high heat. Add about 12 potstickers at a time and cook until the bottoms are golden brown, about 2-1/2 to 3 minutes. Reduce the heat to medium, add 1/3 cup water to the pan and cover tightly. Cook until the water has evaporated, about 3 more minutes. Repeat with the remaining potstickers. 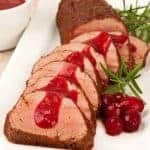 Serve with the soy dipping sauce. To store, freeze uncooked potstickers in a single layer on a plate. Once they are frozen solid, place them in an airtight freezer bag. Store on top of other frozen items (do not crush). They should keep for about 8 weeks. What a coincidence I made potstickers yesterday. Mine did not look as good as yours, but mine tasted great and I’m sure yours do too.